*taps mic* Is This Thing Still On? Okay, so it’s been more than a minute. I think it’s been almost three years. Since last we talked, Clara has turned into a four-year-old sass machine, husband and I celebrated our tenth wedding anniversary, and we decided that one little loin-fruit is going to be it for us. He had a vasectomy a year ago, and I had a uterine ablation surgery this fall to help control my out of control periods (which has been successful thus far – thumbs way up!). Another thing that’s happened in that time – or hasn’t happened, I guess – is writing. I’ve fallen out of love with a lot of things in my life, including my job, my hair color, and blogging. I missed writing too much, though, and I’ve decided to make a comeback, although in a bit of a different genre. 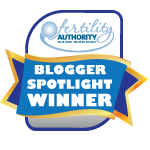 No longer will I be an infertility blogger, since that’s no longer the biggest part of my life, and I’ve said NO to mommy-blogging as well. I started a new venture over at Late Bloomer Press, and I’d love it if you would join me on my quest for more in life, more in my career, more adventures in the ridiculous… just MORE. I can’t guarantee it will align with your life the way it is now, but I can guarantee it will be a fun ride. Thanks to every one of you who followed this story for so many years and through so many trials and triumphs. I hope you’ll consider following me on this next leg of life’s journey! The timing on this is ironic! I was just wondering about you this week. I would love to follow your new journey! OMG I’m heading in the same direction! Just read the first paragraph of “Read receipts: becoming a badass” and I’m hooked already….I’ve just started that book!!! Onwards and upwards fellow infertility come badass woo warrior! Love it!